Keep an eve out for more crazy situations that Pookie will be in and what new things are added to his world. 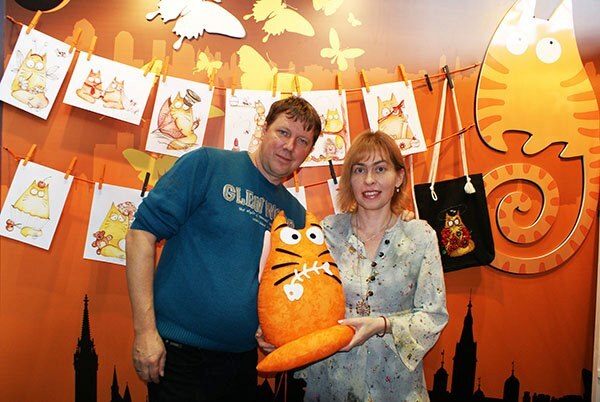 Somewhere in the World lives a wonderful illustrator – loved wife, mother of two kids, owner of 3 cats and 4 dogs, who was born in Moscow but moved from there in the beginning of the 90s. “…If you will ask me if I can paint any specific subject, or theme, or style I will happy say yes, but at the moment it comes to writing my own biography I feel very lost. And it is not because I cannot recall parts of my life, but simply because it all feels less colorful and important than the paintings themselves. I actually wasn’t. My first painting was called “dad behind the tree” it scared my art teacher (my dad) at this time simply because it was two ears behind two lines which represented the tree. I thought it was hilarious, I was 5 years old…. yep, my art expressions changed a bit from this time but I guess sometimes I still like the style of the “dad behind the tree” too – simplicity is a big secret. I was born in a busy Moscow (Russia) in a great family which always was creating. My father is art teacher and designer, my mother is biochemistry doctor with very creative skills and I liked to doo-dle on everything. I even had a special arrangement at school – I would be able to listen only if I could scribble some-thing on the piece of paper. So yes, art was practically following me daily. And no, I wasn’t looking at it in any serious way – I just thought it was inseparable part of my life. Moving from Russia in 1990 gave me the possibility to see different parts of the world, it added much to my paintings. Fantasy art was giving me a feeling of seeing something that was “beyond” the usual, standard and grey. It was happy, colorful and always changing. I was excited to have much inspiration every day – my kids, nature, range of feelings, my pets. I was invited to be published in several art books, magazines and art projects all through the world. 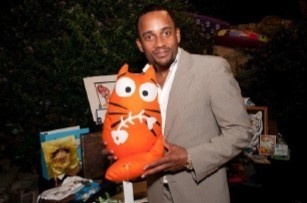 USA, Australia, UK, Belgium, Israel… my cats even appeared at the ESPY awards in 2010 and was photographed with celebrities, like Hill Harper of the hit series CSI New York. This year I have much more exciting projects coming out. My art is constantly changing – it is growing with me together, expressing my feelings and reflect-ing the situation of my daily life. I hope it made you smile, laugh, think or even be sad for a moment. Maria is internationally known thanks for the funny orange cat named Pookie. First picture in this series she painted 2 years ago. Then she couldn’t imagine that Pookie in the future will become such a popular brand. She started painting them only with a one goal – to cheer up herself from the life difficulties. 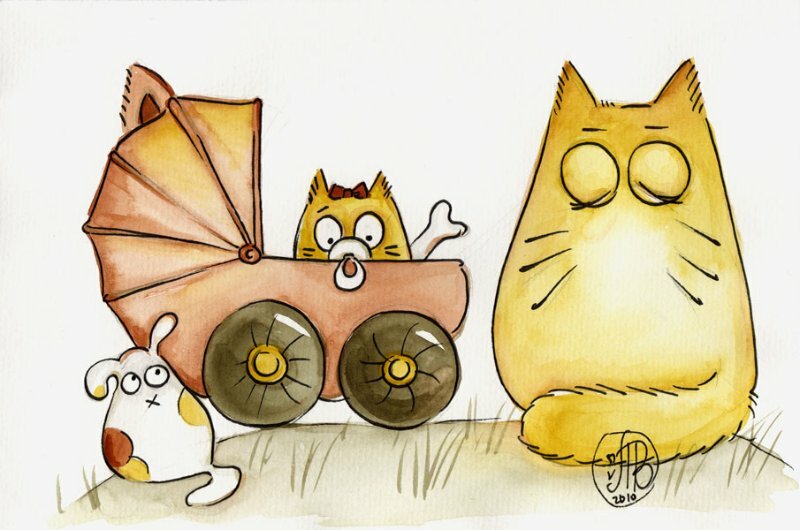 « Funny enough cats was pretty special – they didn’t had any nose, mouth or feet. Only eyes. I still remember that my granny used to say that eyes – they are always telling the truth. We can smile, yet our eyes can say something different, because all the true and sincere emotions projected by our eyes. Maybe it’s why Pookie character was chosen like this…” — writes Maria in her Blog. Fast enough it turned out that this funny orange cat lifted the mood not only for her! Pookie was winning prizes and going to the finals in book illustration competitions. Maria was invited to license her illustrations to numerous magazines and publishing houses in USA, Australia, UK, Belgium, Israel and other countries. With time Pookie got friends and in the story about Pookie appeared hedgehogs, puppies, owls and mouse’s. 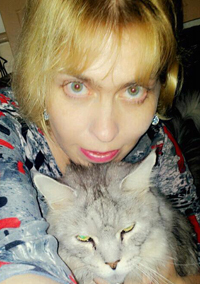 Several products was published featuring Pookie the cat. Pookie was helping everybody to live their days with a smile. Nice to write to you here. This is Tony from Conquer Toys&Arts ,we’re a plush toys manufacturer in North of China. And i just sent email to your mailbox . Please kindly check and let you know your reply,thank you. Came across teh site from your CGC Group introduction on LInkedIn. First I have just one constructive comment and that is in your writings and translations to English, you use the word YOU, when often times it needs to actually read YOUR. Maybe you already know this? Next would love to assist with any in-store shop needs if that comes about? ANy interest and send me an email so we can go into further discussions and details. I am from the USA but have offices & factories also in China.